For many, summertime offers that rare window of endless, hot days that seem to rule out any sort of physical activity but encourage hours of reading. 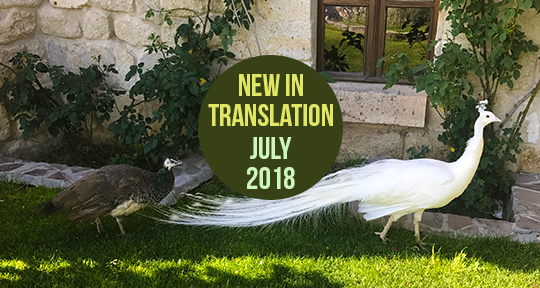 While these might not be easy beach reads in the traditional sense of online listicles, we are here with a few recommendations of our favorite translations coming out this month! These particular books, from China, France, and Argentina, each explore questions of masculinity, death, and creativity in unexpected ways while also challenging conventional narrative structures. As always, check out the Asymptote Book Club for a specially curated new title each month. If that all sounds like something of a tortuous journey for a partially-published-yet-also-unfinished novel from 1940s China to make on its way into English, it’s only appropriate given the itinerant life and rampant misfortune that befalls its eponymous figure. Narrated at a breathless pace, the novel possesses a first-class wit and striking prose. It even possesses the kind of fantastic first line that writers everywhere aspire to: “Ma Bo’le was a coward even before the war.” Such apparent simplicity belies a deeper sophistication, which also holds true for the rest of this novel set against the backdrop of the Second Sino-Japanese War. Often guided by his stomach—even when everything else seems to go wrong, he always finds his way to a bowl of fried rice or some baozi—Ma Bo’le nevertheless lacks a good gut as far as instincts go. The one exception is his belief that the Japanese will attack, an event that does come to pass and that reunites him with his fleeing family. It marks the beginning of years spent as refugees before settling, at long last, in Hong Kong. Along the way, Ma Bo’le finally starts to shake off what had seemed inescapable for so many years: the bad habits, absentmindedness, and narrow outlook that had made him an absent husband and father. (As one of his children reminds us in a simultaneously narratological and ethical aside, “the character who holds a tale together is often not the prominent one,” and in this case it is undoubtedly the wife and mother.) He isn’t an entirely changed man—his newfound ability to focus, for instance, becomes a dedication to learning Esperanto, a language he does not find much occasion to use—but he does begin making at least a few adjustments. Those small changes form part of a second life, and we have Goldblatt to thank for this reincarnation of the text as both a completed version and an English one. Such a resurrection also mirrors what happened to Xiao Hong, who was nearly forgotten for a few decades before being recognized again as one of China’s most important writers. 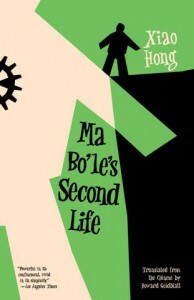 The subject of two recent biopics, she still deserves more attention in the English-speaking world—a third life, we might say—and the excellent Ma Bo’le’s Second Life should certainly provide it. 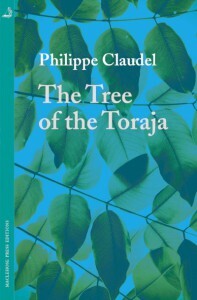 The Tree of the Toraja by Philippe Claudel, translated from the French by Euan Cameron, MacLehose Press, 2018. Following this description, Claudel’s novel shifts focus almost immediately to the life of its aging filmmaker-protagonist in Paris—how he copes with his best friend succumbing to cancer; his relationship with his ex-wife with whom he remains intimate even as they gradually drift apart; his new love affair with a young research scientist whom he first encounters while watching her apartment from his window; and importantly, his memories and past experiences, which have become an integral part of him, just as the infants’ bodies have become a part of the Torajan tree. And so the novel centers around the tree even as it alludes to the tree only briefly every now and then. The tree functions as a trope for the process of living undergone by the protagonist and most of the people around him, which is also the process of dying. This is no bildungsroman, concerned with the maturation of a wide-eyed innocent for whom all life is new; our narrator is in his twilight years, accomplished and respected, established and seasoned. People and scenes from his past are woven into his present, as with the titular tree. “We who live on are enveloped by the whispers of our ghosts,” the narrator observes. Insofar as the novel has a central plot, it’s the slow death of the narrator’s best friend Eugène, poignant scenes from which the narrator continues to revisit in no particular chronological order. Eugène himself, in his illness, becomes not unlike the tree; he becomes convinced that the cancer growing in him is “a sort of cyst that had accumulated all the negative charges his life had produced or undergone”—akin to how the tree accumulates and integrates the abruptly shortened lives of others into itself. So while on the one hand there is something life-affirming and positive about the tree—how it co-opts death to produce life—there is also something vaguely sinister about this process of absorbing others into one’s self. This insidious, colonizing quality is very faint, but nonetheless present: at one point the narrator even states somewhat creepily when describing the habit he acquires of watching other people in their apartments in a fashion reminiscent of Hitchcock’s Rear Window, “I had eventually come to incorporate these lives into mine, to fuse their timetables with my own.” There is a sense that, as a reasonably successful, virile, elderly European male, the narrator enjoys the privilege of moving through the world with relative ease, taking in people and places and making them, through experiencing them, part of himself. (The novel is aware of its protagonist’s privilege, as implied by a remark made by his lover about society’s esteem for the “elderly male.”) His successful wooing of the young research scientist is so effortless that no space is devoted to its telling—it seems to happen as a matter of course. The narrator also refers to other images that have embedded themselves in his mind, involving foreign cultures besides that of the Toraja: Chinese men shouting unintelligibly at each other in Vietnam; an overcrowded boatload of Libyan refugees he sees on the television news whom he describes as “a weird and worrying apparition.” These images disorient him, compel him to question his ability to interpret the world accurately, forcing him to realize that people “can only be read correctly and without misinterpretation within a circumscribed bubble, which is the culture in which we have grown up in or in which we have lived long enough.” The narrator’s assimilation of these encounters with the unfamiliar, including the Torajan tree, in order to fuel his ongoing personal growth has an unmistakably Orientalist tinge. Claudel’s novel invites us to reflect on the contiguity—and unity—of living and dying, others and selves, the past and present and future. We are accretions of lives and moments, expanding tree-like, embedded ourselves in a larger tree called life, comprised of aging yet childlike bodies, time working our decay even as it lifts us towards the sky. The title of the deeply unsettling and beautiful new book from Coffee House Press names a carnivorous plant, the comemadre, that produces an organism that devours its own mother: “a plant with acicular leaves whose sap produces (in a leap between taxonomic kingdom that warrants further study) microscopic animal larvae. These larvae devour the plant, leaving only tiny particles behind: the remains then spread to take root in the soil, and the process begins again.” With the constant presence of this flesh-eating, matricidal plant, Comemadre explores the extent of corporal manipulation to which some people will go in the search for transcendence. 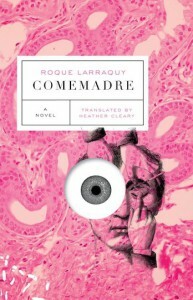 Written by Argentine author Roque Larraquy and brilliantly translated by Heather Cleary, this novel is composed of two loosely-connected stories that explore scientific and artistic modes of dissecting the body in the hopes of learning about something that exists beyond reality. In the first half, a group of doctors at a sanatorium on the outskirts of Buenos Aires in the beginning of the twentieth century learn that an individual continues to be conscious for nine seconds after his or her head has been severed from the body. With this in mind, they set up an elaborate experiment meant to induce the patients—or victims—to articulate their experience in those nine seconds. The second half takes us nearly a decade into the twenty-first century, introducing the reader to an artist and his double who, in the name of art, destroy bodies by severing fingers, surgically transfiguring themselves into another man, and introducing the comemadre to a man’s leg. While the two halves more or less read as separate stories, they are connected by themes of the body, sexual desire, and knowledge, tiny details or imagery that reappear, such as little metal frogs, and family connections. As a whole, this is a meticulous and startling exploration of the male body and monstrosity. I look out the window: there are the ants, marching around their crack in a perfect circle. They are the animal reality nearest to me (I could go down there and smudge out that circle with my foot), along with the flies in Sylvia’s face, Papini’s apes, the Cartesian duck, and the hypothetical amphibian lurking inside Menéndez. The setting of the sanatorium, the animal imagery, and the heads severed in the name of science, suggest that this text is operating in a space on the fringe of society, and even of humanity. While the first half of the book is stronger in its narrative cohesion and effect, the second half excels in its experimentation as perspectives, style, and form shift quite fluidly while also creating subtle bridges to the first half. Relics and traces of the past continuously show up throughout the text, effectively conflating and manipulating time. Severed heads, photographs of hands, metal frogs, scars, notebooks, and the act of writing are prominent throughout the novel. At the same time, however, the book is haunted by a plant that devours evidence, that erases that intersection of time. The language, which Cleary does a remarkable job transforming into English, draws the reader into the story, making him or her complicit in the horror through his or her spectatorship. The consumption of this novel is quick, but the text will inevitably continue to haunt its reader.